Without Hope are a 4-Piece metalcore band hailing from the Sacramento area in California. Gaining their sound by mixing heavy breakdowns, articulate riffs, ambient cleans, and heartfelt lyrics Without Hope's goal is to bring forth awareness and to build a better music community every performance. The band premiered the new single coming "ColorBlind" on BlankTV June 1st. It carries the same emotional intensity their album 'In Search Of..' has, but delves a bit deeper and progresses the band into a new chapter. 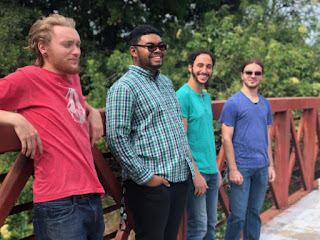 "We wanted to show the growth we made in the time since we've written and released 'In Search Of..' last fall and are planning on a new record to come out in 2019," says band leader DeVonte Thomas. 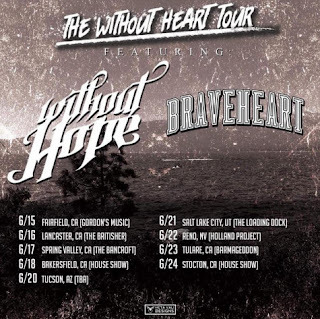 Without Hope are going on a tour in June with their friends in Brave Heart. We'll be going through the southwest hitting Southern California, Arizona, Utah, and Nevada. "We had the pleasure of doing a small run with Brave Heart last fall and knew we had to do it again. Our good friend David Tyler of the band Mothersound played a crucial roll in booking this tour and we are forever thankful for his hard work!" Check out their new single HERE and the list of dates embedded within the tour poster below!